It is important to consider the potential dimensional shrinkage and movement of green timber. Depending on the species, boards may shrink by 10% over the first two to three years as the wood dries. 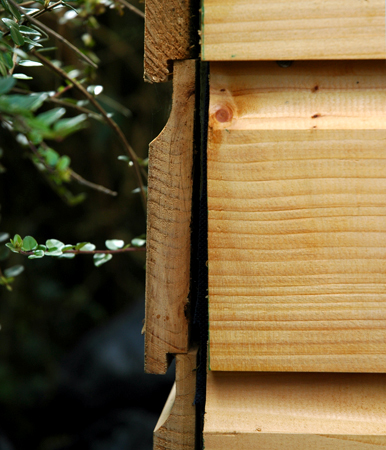 If exposed to hot dry weather before, or soon after, fitting, boards are likely to cup, warp and split. The best time to fit cladding is in the autumn or winter.The following information is provided in the spirit of general advice. It is not intended as a comprehensive guide. If in doubt, we recommend employing a skilled tradesperson to carry out the installation. 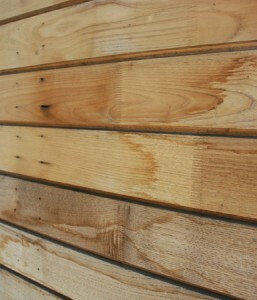 An example of blue staining in sweet chestnut as a result of using ferrous nails. Most cladding boards can be fixed with nails. Some hardwood profiles may benefit from screws or bolts. Fixings must be galvanized or stainless steel. When using species with high tannin or corrosive oil content (refer to species descriptions), it is important to use stainless steel to avoid corrosion of fixings and blue staining of the wood. Ring shank nails are preferable to normal wire nails because of their extra grip. The length of the nail should be two and a half times the thickness of the board. The nail should penetrate the batten by at least 32mm. Hardwoods and dense softwoods such as Siberian larch will need pre-drilling. Where boards are double-nailed, it is advisable to pre-drill over-sized holes to allow for some dimensional movement. In this instance it may be necessary to use fixings with larger heads. 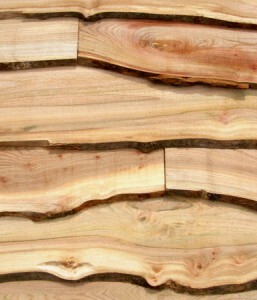 For further information, please refer to TRADA Publication ‘External Timber Cladding’. ISBN 1900510308.